Wow, what a busy past week-and-a-half. I’m currently in the midst of my strange and exhausting three days back in California, writing this early in the morning (I’ve forced myself onto an early schedule, since I’ll have to get up at 4am tomorrow for my flight to South America). So apologies if I’m less coherent than usual =). I’ll rewind and start last Tuesday, the day before the conference began. Although it wasn’t related to the conference, the folks in the Sydney office wanted to know more about my team’s project back in Mountain View, so I gave a little “Tech Talk” for them that afternoon. Not my best presentation, to be honest, but they seemed happy with it and asked a lot of questions. That night I went out for Malaysian food at the ever-busy Mamak, waited in the obligatory line for 15 minutes (short! ), and had a giant bowl of fish curry. Lots of bones, as expected, but very tasty. Wednesday officially kicked off the conference. The first two days were dedicated to coding on related projects, so we split up into teams and started working. We lost a lot of time and productivity that day, though, because by early afternoon the US election results were starting to stream in! (Tuesday 8pm in New York = Wednesday noon in Sydney.) My team, along with the rest of the office, watched closely and nervously. I’m still having “residual relief”, although its starting to wear off – i.e. every time I think of the election, I’m overcome with relief. In the moment, that Wednesday, we were all so jittery and distracted by it that almost nothing got done. I ended up working til about 9:30 that night, to make up for it. In case you were wondering: Australians are, by and large, very pro-Obama. Check out this poll for some numbers; in short, though, Australia was the second most pro-Obama country in the world this year (that they surveyed), only behind France. I didn’t come across a single Romney supporter in the office; or if I did, they didn’t make their opinion known amongst the overwhelming pro-Obama excitement. Thursday was our last push to finish our projects, culminating with a little show-and-tell at the end of the day. Sorry I can’t say more about what I presented – as you can understand, company secrets. We did finish, though, with only minutes to spare, and had a nice little demo to show. 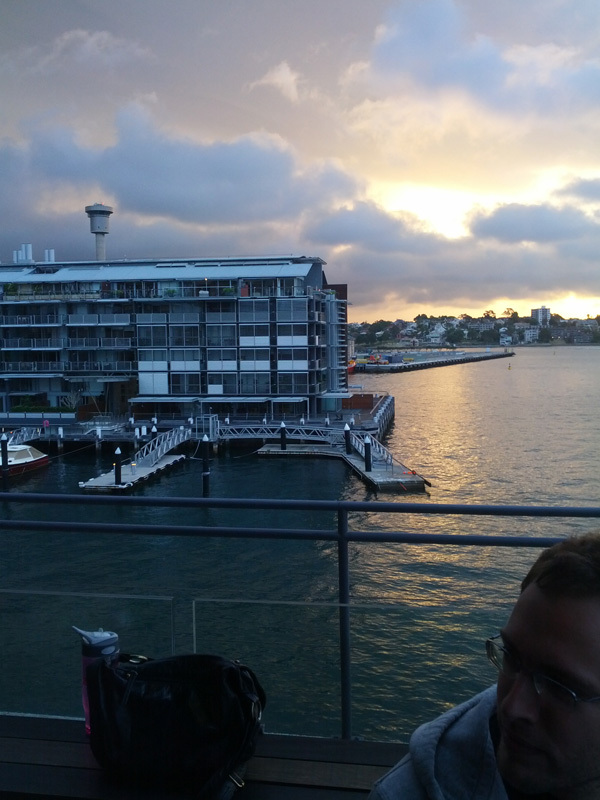 That night was the first company-sponsored outing of the conference – and let me tell you, the Google Sydney office is no stranger to spending money. A private bus dropped us off at The Bar at the End of the Wharf, and our private corner patio had spectacular views of the harbour and the bridge. I took advantage of the open bar tab by ordering one of the most expensive cocktails on the menu. The food tab was not open, however, as this was just meant to be drinks and appetizers; and since almost all the appetizers were gluten-y good, I walked back to Home Thai for dinner afterward – I couldn’t resist going back. I had a duck curry, always one of my favorites, and I wasn’t disappointed. Oddly enough, while eating that duck curry, I noticed that something got stuck in my throat – I’m pretty sure it was a seed pod from one of the thai baby eggplants that I love so much. I tried to get it out, but with no luck. The feel of it got less noticeable as the days went on, but it never disappeared. When I got home earlier this week, I had dinner with my parents and my mom took a look to see if she could spot it. Sure enough, there it was, a sharp, sizable (2/3 of an inch long?) seed pod, stuck into one of my tonsils! Eeh! Once we knew where it was, it was easy to remove. Phew! End of random tangent; back to Sydney. Friday was the start of actual conference sessions, which were, well, conference sessions. Some were interesting, and some were pretty dull. It was a good learning experience for me, though, since it exposed me to some pieces of Maps that I hadn’t worked with before. The whole conference, really, was invaluable in that sense; I learned so much more about everything Google Maps / Maps API in those few days. I… I could rant on about the up-sides of the conference, actually, but I’ll save it. Friday night featured another company event; after the sessions, we started a scavenger hunt around The Rocks, which ended at Argyle, a pretty swanky restaurant and bar. Open bar and food tab, this time. The ~40 of us consumed… a lot. The highlight order of the night was for six jugs – jugs – of cocktails. This was followed later by another order for another six jugs, after the first six had run out. And there may have been another jug order after that; I lost count. 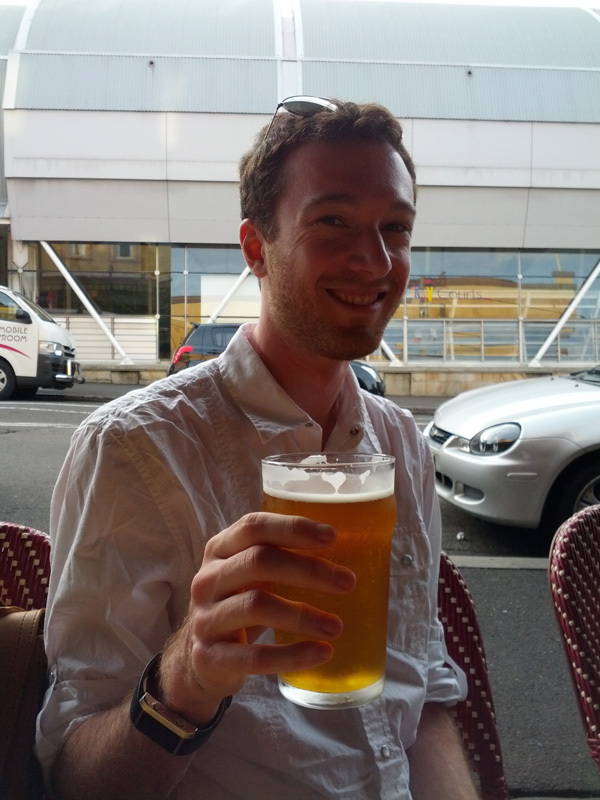 In case it wasn’t obvious from this post or the last, Australians really drink, and us visitors do our best to keep up. The conference-goers started leaving by around 10, but I hung around with the last stragglers until about 10:30 when, coincidentally enough, Abdulla rocked up with a bunch of his friends! Abdulla, though he works in the Sydney office, was not part of the conference (he doesn’t work on Maps). I ended up hanging out with Abdulla and company until about 11:30, at which point I forced myself to leave – the conference continued the next morning, Saturday, starting at 9am. It’s a good thing I was on time that morning, too. My session (yes, I hosted a session too) was supposed to happen later that afternoon, but got bumped to the first slot of the day without anyone telling me. It was actually a blessing, though, since by 10:30 I’d done the hardest work for the day and was able to relax. I drifted through the rest of the work day, to be honest; some of the sessions were interesting, but about half of the ones I went to that day were either boring, or else too far above my head for me to really understand. Plus, after stressing about leading that session, I was pretty relieved. Sorry I can’t say any more about it =/. 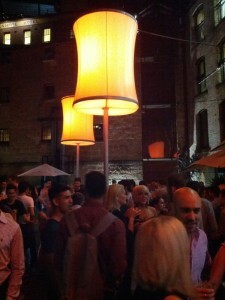 Saturday evening, of course, was yet another Google-sponsored shebang. A boat pulled up at the dock next to the office (yes, there is a dock in front of the office), and we all piled on for a dinner cruise on the harbour. A good amount of wine (read: three large glasses), and a lot of good conversation with the other conference-goers. Another upside of the conference: really getting to talk to people who are much more senior than me, not just about technical things, but as friends. Totally priceless. 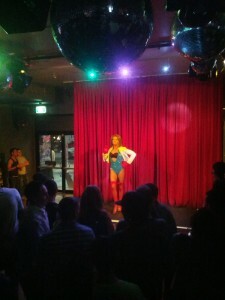 In fact, after the cruise was over, some of us kept hanging out, going to a gay bar on Oxford Street to see a drag show! The whole thing was pretty awesome. Sunday was our one weekend day in the middle of the conference, and my last free moment in Sydney. 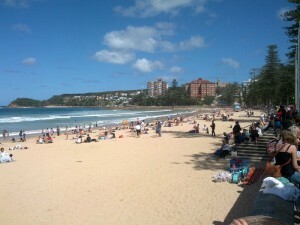 I took full advantage: after lunch with some coworkers, I took the ferry out to Manly for some beach time. The ocean was still cold (hasn’t quite yet warmed up from winter), but I went in anyway – how could I not? Most people were just hanging out on the beach (which I did plenty of too), sunbathing, reading, and playing volleyball. Let me just say: Australian guys, playing volleyball, shirtless, on the beach, are a sight to behold. Once the sun started to set, I took a quick walk out to Shelly Beach and back; I hadn’t been before, and when I saw it in the distance, I had to check it out. 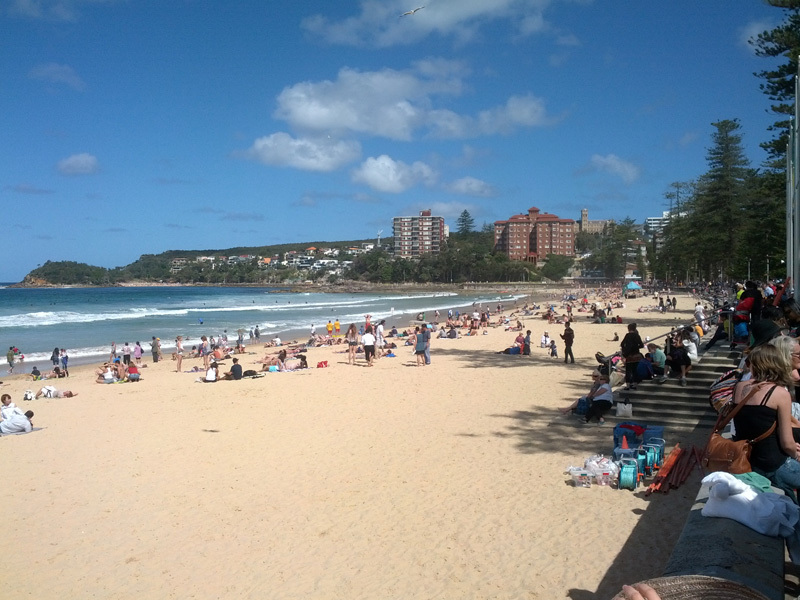 Clearly more of a local scene; Manly is very touristy but Shelly had a lot more Aussies, as evidenced by the BBQs (cue “throw a shrimp on the barbie” lines). Volleyball players included. I got back to the wharf just in time for the ferry back, and after some stomach searching, decided on Korean food for dinner that night. I found Sydney’s little K-Town, and ended up at a neat place tucked away in a basement; nothing super exceptional, but it was still pretty good – on par with Korean food in the Bay Area, I’d say. Monday was the last day of the conference, with no activities planned except a few overview talks with some of the more senior attendees. I got to present the idea from my conference session, which was pretty neat, and otherwise spent the day doing work on my normal project. That night the conference officially wrapped up, with a three-course prix fixe dinner at a French restaurant. A couple of us went out to play pool at a pub afterward (the good old Pyrmont Bridge Hotel), after which I (very sadly) went back to the hotel to pack. Time’s up. I went to the airport first thing the next morning, and a day later was back here in California. I won’t ramble on too much about the flight experience, like I did last time. It was pretty similar: total business class luxury, plenty of alcohol, and no sleep. The food involved, however, was better this time. In the business class lounge in Auckland, they had a giant, really good, “free” (with your purchase of an absurd business class ticket) buffet, and fridges full of all the alcohol you can take. I had an Isaac’s Cider – how could I possibly resist – and some chicken curry. The gluten-free meal in business class was also better this time – the three dinner courses, including a nut and olive platter, a fancier chicken dish, and a slice of gluten-free chocolate cheesecake (!). Pair that with one glass of sparkling wine, two glasses of Pinot Noir, and one glass of a dessert wine, plus some good music, and I was in a great mood – sleep or no sleep. And that wraps up Sydney! I was really, really sad to leave. That place does still have a special place in my heart. I seem to be on a roll: one visit in 2010, one in 2011, one in 2012; I think I’ll have to get myself back there at some point in 2013, one way or another.. Since then, I’ve been hurrying around back home in somewhat of a daze. Normally, after a big trip, it’s nice to get cozy with the usual old routines again, do some work, see friends, spend several days doing nothing special. I haven’t really had the chance – there’s no time! I’m exhausted, but of course excited too. As of now (now being Thursday evening..), I’ve got less than 24 hours before I land in Quito, Ecuador. When Abdulla, his friends, and I were at Argyle on Friday, Abdulla said he wanted to go “take a squiz at the dance floor”. Sounded inappropriate to me. Apparently a “squiz” is a “look”, i.e. taking a look at the dance floor. Next time from South America! dude that eggplant pod thing sounds terrifyng. glad you got it out. I second Dinah’s comment, ack! It’s crazy how tonsils can just eat things up.